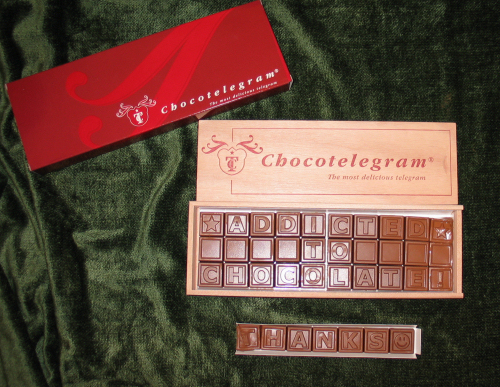 A couple of weeks ago I wrote about an innovative new use for chocolate – the Chocotelegram. Well, today we got our very own to sample! We received both a large 30-square message reading “Addicted to Chocolate!” and a smaller 7-square block reading “Thanks.” Both the 30-square and 60-square boxes are made of wood with a sliding top, while other sizes are packaged in attractive cardboard boxes. The company clearly cares about their product; the chocolate was packaged in an insulating wrap and had an ice pack included. Nevertheless, as you can see in the photo, there was a bit of melting. To solidify things again I stuck them in the fridge for a few hours. Temperatures here in New York have been on the toasty side, so it isn’t surprising that there was some melting. The chocolate itself was very good. It was creamy and smooth and lived up to its promise of “Premium Belgian Chocolate.” Unlike many of the other chocolate products out there that can be personalized, this was high quality and not at all grainy. The only downside is that the message isn’t going to last long at the rate the chocolate gets eaten! Costs range from $7 to $72, and they have a handy tool on their website that allows you to design personalized messages and see how they can be implemented. 72.00 dollars ready to be well spent! haha.